Make retirement the best years of your life. We help busy professionals plan their finances and manage their investments. Start by getting clear answers to your questions about financial, retirement and estate planning. We’ll help you create a customized financial plan to avoid common mistakes and build financial security. Protect and grow your wealth with an investment partner who puts your interests first. We give you a well-diversified, well-researched strategy to manage your money and make adjustments as your goals change or new opportunities arise. asset management and financial planning tool. What Does Your Retirement Look Like From Here? Chances are, your retirement planning thus far has amounted to saving as much as you can, worrying about how it’s invested, and wondering when you’ll know that you’re ready and able to take the plunge into actual retirement. That’s kind of like ‘planning’ a trip by stockpiling all the food and water you possibly can, while not giving any real thought about where exactly you are going and what you will do once you get there. The average person is 40% more likely to become clinically depressed soon after he or she retires. Yeah, I know. It’s depressing to even think about that. So, let’s think about something wonderful instead. Let’s think about the potential you have to enjoy the healthiest, longest, and most satisfying retirement years in human history. A great retirement requires some great retirement planning. And that’s what we’re here to help you do. Think, for a moment, about one of your greatest vacations. Remember the excitement, anticipation, and joy you experienced planning that trip? Chances are, that planning was nearly as memorable as the trip itself. Your retirement is the trip of your lifetime. Planning it should be fun … as you contemplate where you want to live, how you want to live, what you will do and when you will do it. My bet is that, when approached thoughtfully and insightfully, your idea of a great retirement will be far more personal, more specific, more satisfying, and more exciting than you first imagine. So, what’s first? You probably have some starting questions. Let’s talk and get them out of the way. Schedule a free strategy session and tell us what you want your future to look like. Align your portfolio with your goals for retirement. Transition smoothly into retirement and experience everything on your bucket list. WHAT’S IN A STRATEGY SESSION? Enjoy a candid and thought-provoking conversation with Jeremy. Get answers to your questions and figure out the next steps for your financial planning and investing strategy. Want to process things before we meet for a strategy session? 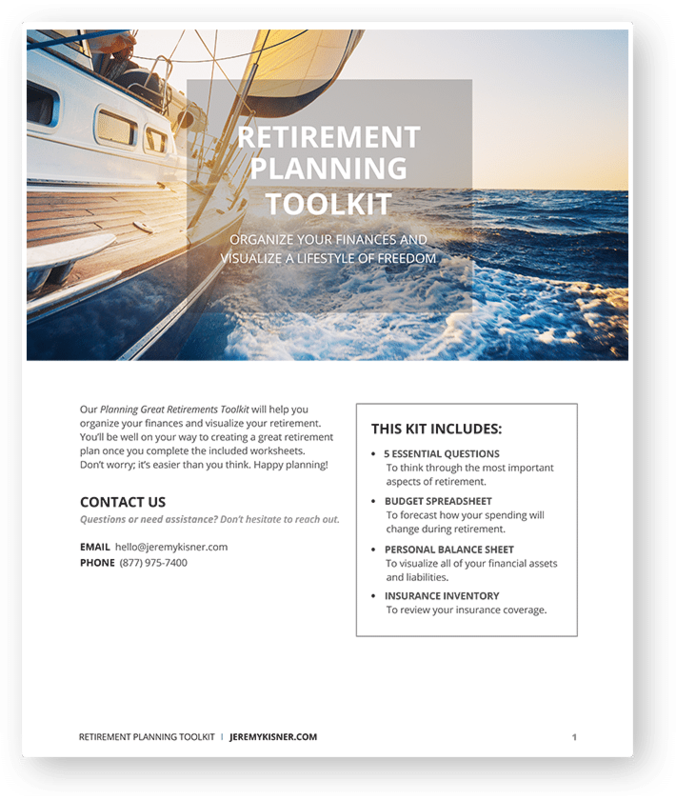 Take advantage of my Retirement Planning Toolkit. It will help you visualize your great retirement and start to organize your finances. Then, schedule a free strategy session when you’re ready. We advised a widow about provisions she could add to her trust to ensure her financially irresponsible daughter will never be homeless, and worked with her attorney to get it done. We helped a newly retired couple plan to sell their rental properties and trade their current vacation home for one closer to their children and grandchildren. …Decide what they want out of retirement. We helped a workaholic engineer figure what she wants to do with the rest of her life, and then developed a financial plan showing it was possible. We helped a small business owner sell his business and use the proceeds to create lifetime income and a financial legacy for his family. Now how can we help you?